One of the most fundamental problems with b*stards, is that they don’t know they are actually b*stards. True. You just ask any b*stard if they're a b*stard, and they would immediately deny it straight away. Well, that is unless they were the Director: Werner Herzog; or the Actors: Nicolas Cage, Eva Mendes, and Val Kilmer. But only in the year 2009, and for 122-minutes. So there he was. Lieutenant Terrence McDonagh (Nicolas Cage). The bad-cop with a bad-back with a bad drug-habit to feed. Partnered up with another bad-cop, Stevie Pruit (Val Kilmer), in the New Orleans Police department. What next, huh? What should Terrance do next with his big bad life? Hallucinate about snakes whenever the need arises? Take his fathers dog out for a walk once in awhile? Pay off his bookmaker, Ned Schoenholtz (Brad Dourif ), because he cannot squelch his parking fines? Or what about dealing with two very specific problems which come his way? PROBLEM ONE: When Terrance hears the tragic news of a family massacre at a convenience store, he and his colleagues attempt to apprehend the culprits involved, by nabbing someone who witnessed this crime, named Daryl (Denzel Whitaker). But no. This doesn't really pan out in the way Terrance hoped it would. Cause the person behind this slaughter is none other than the crime boss, Big Fate (Xzibi), who quickly ‘lawyers up’, prompting Daryl to leave the country scared for his very life, and prompting the department to demote Terrance to stockroom duties, because of the way he tried to rectify this situation. PROBLEM TWO: Terrance didn't know how much it would cost him when he helped out his prostitute lady-friend, Frankie Donnenfeld (Eva Mendes), with a spot of bother she was having with a violent client of hers. Well, if it wasn't bad enough that her client’s father is a very influential man, worst still, he demands that Terrance pays him fifty thousand dollars as retribution for ‘services not rendered’. SOLUTIONS: Now with all of this on his plate, Terrance devises a very cunning plan to wipe his slate completely clean. For a start, he goes to Big Fate and tempts him with an offer that will make them both a lot of money. Next, with this money in hand, he will place a bet with his bookmaker, Ned. So finally, with his winnings, he will pay off the influential man’s debts. Hey! Sound's like a simple thing to do, doesn't it? Yet that's most probably why what next transpires is a rather bad time for most of the people involved. As gangsters fight – bets are tight – crimes are solved – past sins are absolved – and one year later, a new bad Captain stands brave and bold. Please allow me to begin my review by saying that this film isn't a remake of Abel Ferrara’s 1992 masterpiece of the same name (click here for that review). No. 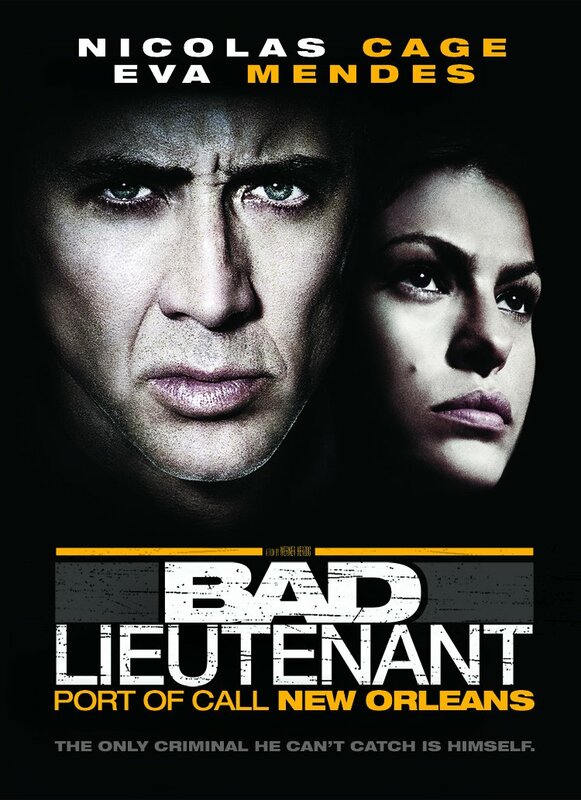 This version of ‘Bad Lieutenant’ is a very different kettle of fish altogether. Even though they do share similar themes. You see, just like Abel’s film, this one is a story about a man who doesn't seem to be able to handle his own demons, and appears to be digging himself into a bigger grave the more the story progresses. However, unlike Abel’s film, the main protagonist in this one does manage to rectify most of his problems, whilst still seemingly persevering with his own mental-state amidst the films conclusion. Listen now. This is not a slight in any way, shape, or form. Rather, it is an observation on where these two films diverge in both content and character progression. Here. Let me give you some more details in bullet point form. (1) The main character in this film -- as played by Nicholas (the master) Cage -- is named, and does have a back-story that justifies his disposition. For example, he has a bad back and comes from a troubled home. (2) There's an extra female dilemma posed to the protagonist -- as played by Eva (I want to give her a baby) Mendez -- which involves him helping her out, by repelling some high powered goons who are against her. (3) There are some superficial and surreal sequences filtered throughout this adventure-- as played by numerous reptiles -- as if to signify the drug addled state Nicholas Cage’s character is in. (4) The tone of this movie is very different in comparison, because it has a bolder and contrasting quality about it, as if the screen is a polarized photograph and not real life. (5) The supporting characters all have a lot more presence in this film than they did in Abel’s. And this gives the problems posed more clarity, whilst diluting the main through-line just a tad. Hey! Do you know what? While I'm in a bullet-point type of a mood, let's us now have some bullet-point filmic-facts. (1) 'First Look Studios' first released this $25 million dollar production on the 20th of November, 2009, and clawed back $10.4 million dollars at the box office. Also, on a side note, the original production was released 18 years to the day before this one was: the 20th of November, 1992. (2) Loosely translated, this project was entitled 'A Corrupt Cop' in Chile; 'Internal Enemy' in Columbia; and 'Police Lawless' in Portugal. (3) Despite this movie being promoted as a remake of Abel Ferrara's version of 'Bad Lieutenant, the director of this version, Werner Herzog, publicly stated that he never saw it before making it, and that it wasn't a direct remake. (4) As the title implies, most of this movie was shot on location throughout the Louisianan state of New Orleans. This includes: Teche Street, Bay Street Louis, plus the Audubon Institute Aquarium of the Americans. (5) William M. Finkelstein, who normally writes for television, got his first screenwriting credit for scripting this feature. (6) The substance Nicolas Cage snorted in this thriller wasn't cocaine, it was baby-powder instead. (7) Eva Mendes worked with two actors in this movie previously: Nicolas Cage in 'Ghost Rider', and Denzel Whitaker in 'Training Day'. (8) Psst! It was Werner Herzog's voice you heard on Frankie's answering machine. He was playing one her clients. (9) When Abel Ferrara first heard that 'Bad Lieutenant' was going to be remade, he said a number of debasing things against it in the press. Firstly, he said this news made him feel sick. Secondly, he said Nicolas Cage was no Harvey Keitel [who was the lead in his version]. And thirdly, he called William M. Finkelstein an idiot. Overall ‘Bad Lieutenant’ is a very nice film to watch. It's well acted. The story is urbane and gritty. The cast is very memorable. Plus to top it all off, it is a very nice film in its own right. Trust me. I shared the same sentiment as Abel did at first. Cause I was dreading what was going to be on offer. Yet it was scenes like this one which follows that finally won me over. Good film. Bad attitude. Nuff said.